A perennial bestseller, our game sausage sampler contains one each of our five varieties of game sausage and includes rabbit sausage, venison sausage, duck sausage, wild boar sausage, and lamb merguez. This collection is the perfect way to try them all and is a natural party-starter. Note: Please see individual product pages for nutritional and allergen information. 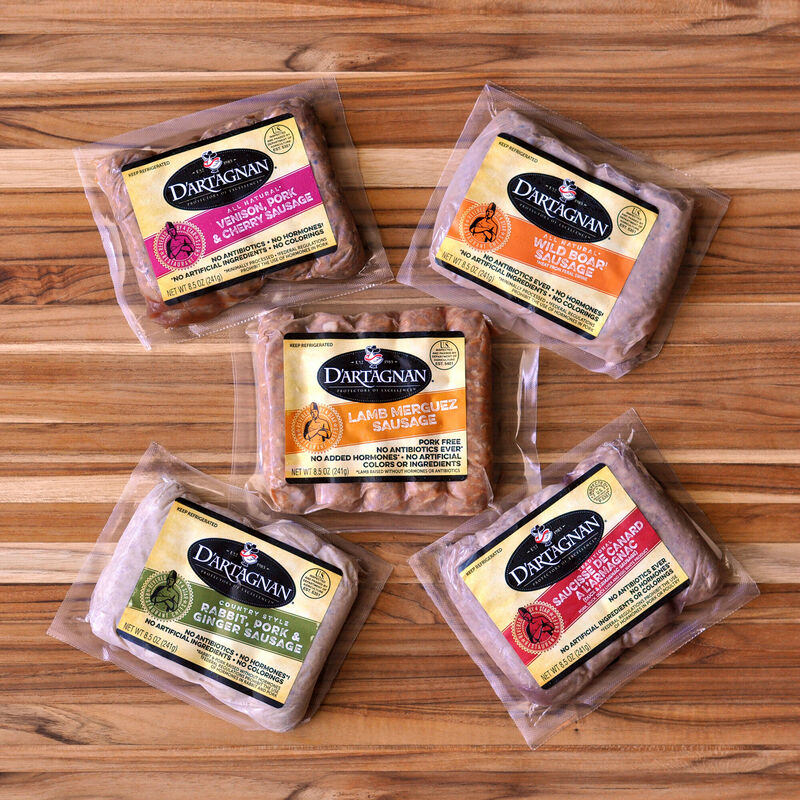 Cooking Tips: For variety, use our game sausages in any sausage recipe. Sauté sausage with onions and peppers, crumble, brown, and add to pasta or casserole; or grill and serve in a bun with your favorite condiments. Sausages can be cooked in or out of the natural casing. When pan-searing or grilling, cook slowly at a moderate temperature to prevent the casing from splitting. Sausages can also be poached or steamed then caramelized in a cast iron pan or on a hot grill. With the exception of lamb merguez, all of our game sausages contain pork and should be cooked through.